The concept behind our Environmental Code of Practice (ECOP) is to ensure company operations are conducted in a manner that minimizes negative environmental aspects, maximizes positive impacts and demonstrates our organization’s commitment to being good stewards of the seas. We believe this can only be accomplished through a comprehensive evaluation of the environmental impacts associated with pearl farming in light of current trends in community and shoreline development, increased demand for limited resources, water quality degradation, and changes in social/political attitudes. Our vision is to establish a Fiji Pearling Industry that will provide an expanding job market and will offer benefits to our communities. 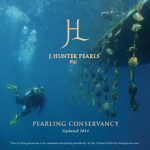 The industry goal is to produce some of the rarest and most exquisite pearls in the world, and to also be responsible in promoting and protecting our unique marine environment and the communities that share them.Our pearl farming activities are based in Savusavu Bay, and Buca Bay, Vanua Levu, in the Republic of the Fiji Islands.